Everyone travels with expectations, hopes, dreams and preconceived notions of a place. My job is to understand These expectations, dreams etc and to exceed them. My aim is not only to show my guests an Italy that they wanted to see but to show them the Italy that they did not know existed. And above all my dream is to convert each and every one of them, to touch their lives in a way that makes them lovers of Italy and things Italian from that moment on. In my humble opinion on this trip: Mission Accomplished. On October 6, 8 women and 1 man met me in Florence. He was either crazy, doing penance for some unspeakable act or the luckiest guy in the world. Actually, I think all of the above. We spent 8 days exploring Tuscany, a very popular region for tourists. Incredibly, this was a first visit for all but two of the travelers. We laughed in the face of jet lag, dodged hoards of tourists like we were in a well coreographed dance, put our gluten and dairy concerns (and any thoughts of diet for that matter) on the back burner as we indulged in wine, cheese, focaccia and gelato. Being naughty never tasted so good. We did a lot: lots of walking, touring beautiful monuments and hill towns. We tasted wines and learned about the complexities of the winemaking process. 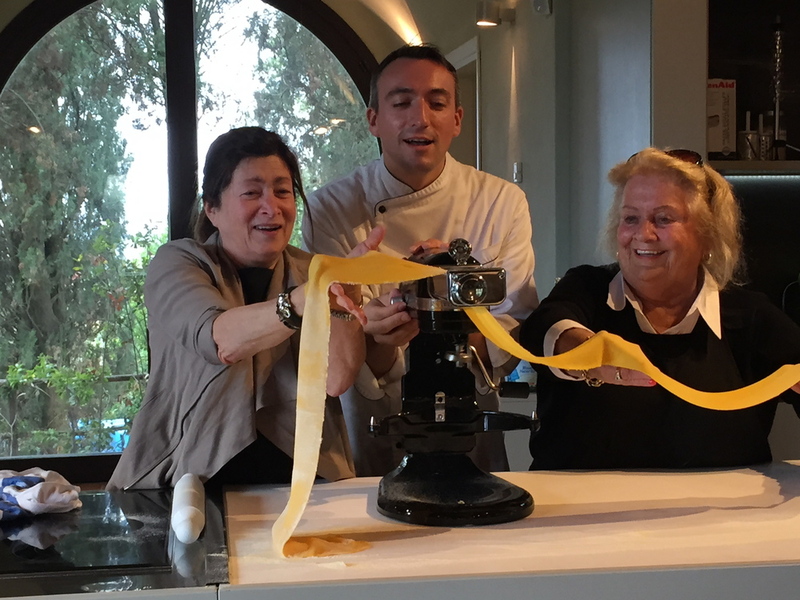 We were graciously welcomed to an Italian home where we learned true Tuscan culinary secrets. We were awed, inspired, reverent and rowdy all in one day. And oh my goodness, did we laugh. And we made others laugh, everywhere we went, from taxi drivers to waiters to shopkeepers. The Italians were delighted by our enthusiasm and our happiness truly seemed contagious. For me, the trip was like hanging out with a group of friends. There was a relaxed pace and general camaraderie that was truly special. We did not see every single thing that "should" be seen in Florence. But we did embrace the true spirit of the Italian culture every day in every way. I am sure the trip meant something different to each and every person on the trip. While I don't know what each person will remember the most, what I do know is this: Tuscany will never be the same! If you were with us, I would welcome hearing your thoughts in the comments below. Arrivederci!